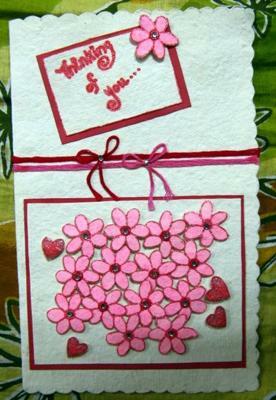 A Handmade Pink Flower Card by Heera!! The card is pretty simple to make.. handmade paper is used as the base..
better than using a plain paper,..
while cutting flowers i made sure that all the flowers were of exactly the same size.. kind of gives a neater look..
the flowers look as if emerging from the card because of the 3-D tape beneath.. i secured it with a strong glue..
you can also use ribbons instead of the embroidery threads, i thought it would be too heavy for the card..
write a small message like "happy birthday" or "thinking of you" on the small rectangle on the top. make sure that you have a good handwriting or else ask your friend to write it for you..! for Decoration add glitter to flowers n hearts..